Our PT has observed some things to me regarding Alex's orthotics and heel lifts and I wanted to get your advice. I have attached pictures that illustrate what I am describing. If you look at the heel views, both of Alex's shoes shoe some shifting outward, but the left is much more noticeable than the right. 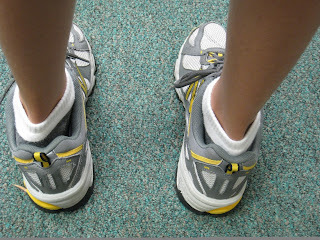 Looking at Alex's achilles tendon, it shows that his left heel is shifting outward (the tendon is to the left of the mid-pt of the rear of the shoe, as compared to the right achilles tendon which is more lined up with the mid-pt of the rear of the shoe). 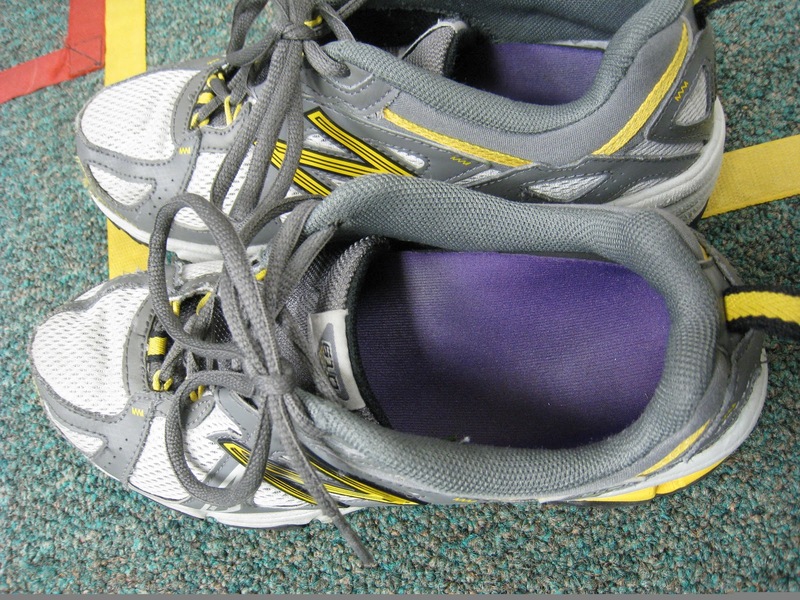 Viewed from the top (heel top view pic), you can see that there is a gap in the shoe on the inside of his left heel. As the day progresses, this gap grows larger than can be seen in the photos. It is enough to stick a few fingers into the shoe along with his foot even with the shoe tied more tightly. 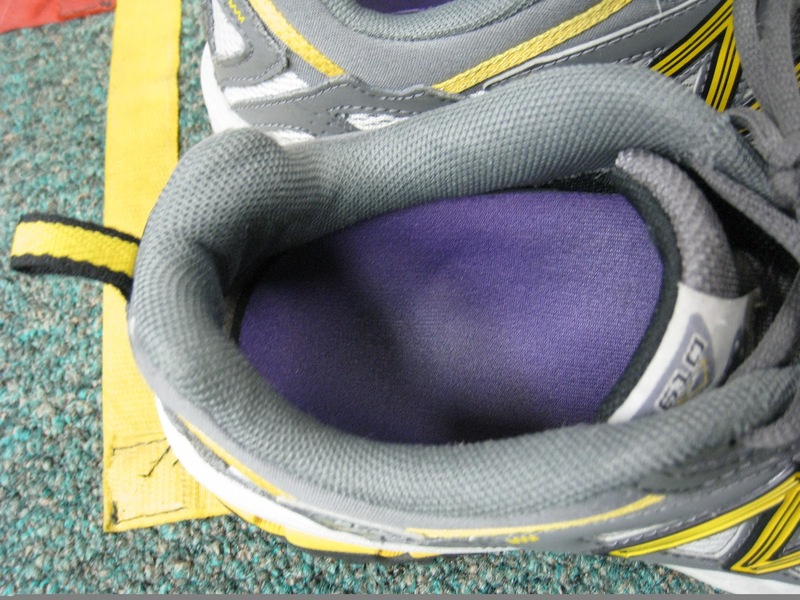 Also, I think with the heel lifts, Alex's foot is higher and closer to the top of the shoe, especially the left side insert where the arch is higher, the insert touches the inside top rim of the shoe while the right side sits lower (insert left and right shoe pic). I am wondering if the added height of the lifts along with the insert, is causing Alex's foot to maybe angle him to much outward (evert?). Alex's PT is wondering if maybe the heel cup were to be built up a little more on the outside of the heel, if that might not keep Alex's left foot/heel from shifting outward. Joan, Thanks for you patience in my response. I was on vacation to Hawaii last week (someone has to support Obama's state). Definitely Alex is being thrown too far to the outside (inverted). Could you please bring him in for an adjustment (although if this is difficult I could do an initial adjustment as long as I had his shoe and orthotic for several days). 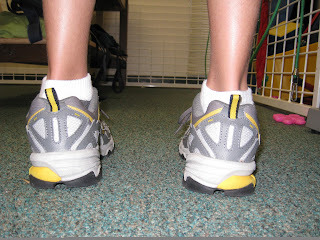 Lifts and orthotics can elevate the heel too much in certain shoes, and especially in this one. The adjustments to lower the heel and center his foot should be relatively easy, but if the shoe is standing inverted now with his feet and no inserts, he will have to purchase a new shoe. Hopefully this shoe can be salvaged. I definitely prefer the appt however. Always great to see you. Thank you for the wonderful photos. I hope you do not mind I will put them on the blog. You are just wonderful to keep an eye on all this, and please thank the PT--excellent pick up. This is okay for a little while, but would eventually cause another problem.